Our garden is producing a few last-minute things – well, mostly onions at this point. Along with that, we have our ongoing crusade to use up all of the things in our pantry and freezer, including such items as cans of diced tomatoes and premade pizza crust (as I mentioned before, I’d rather make my own crust, but Sarah found an amazing sale on several cans of it and picked them up). 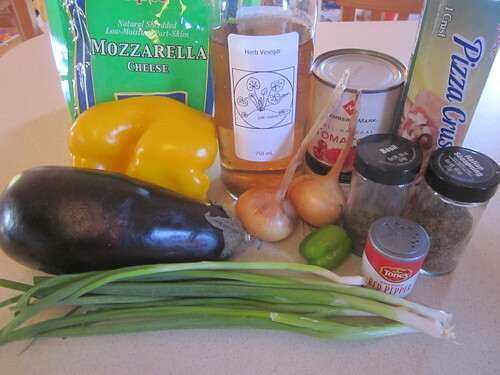 What to do… what to do… how about we mix all of these things together and make something of a ratatouille casserole? Sounds like a plan to me. 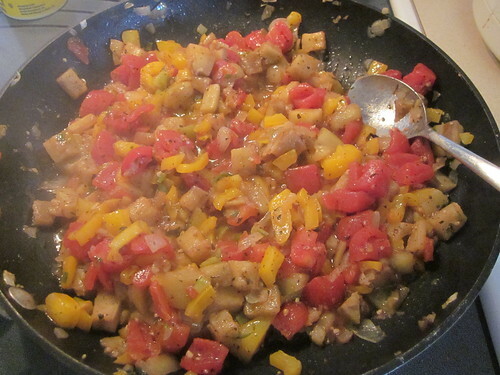 The nice thing about ratatouille is that you can pretty much use whatever flavorful vegetables you have on hand. In our case, we had a can of tomatoes and an eggplant, as well as some onions and a pepper from the garden. All you need is eight or so cups of your favorite vegetables. In addition, you’ll need three teaspoons of olive oil, 2 teaspoons of minced garlic, a taspoon of dried basil, a teaspoon of red pepper flakes, a dash of salt, 2 teaspoons of balsamic vinegar, a package of refrigerated pizza dough (or a small batch of homemade dough, which is my own personal preference), and two cups of shredded cheese, preferably mozzarella or a mix with at least some mozzarella in it. Chop up your vegetables! This is always a good thing to do the night before you prepare a homemade meal. Just chop them into small pieces and store them in the refrigerator until you’re ready to use them. Since this recipe is so quick to put together, the first thing you should do is get your oven preheating to 425 F. After that, put the oil into a large skillet and start adding your vegetables. Can’t you just smell the onions cooking? You’ll want to add vegetables in order of firmness, so you’ll add things like onions and pepper first, let them cook for five or so minutes over medium high heat while stirring, then add some softer vegetables like eggplant and garlic, cook for five more minutes while stirring, then add the very soft vegetables like tomatoes and cook for five more minutes. Add your spices with the softest vegetables, so toss in the basil, red pepper flakes, and salt at this point. 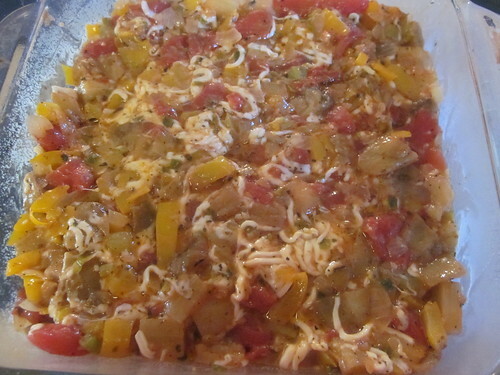 Right as you pull the mixture out of the pan, add half of the cheese and mix it thoroughly into the vegetable mix. Then, put the mixture into a 9″ by 13″ casserole. Sprinkle the remaining cheese on top of the mix, then put the pizza crust on top of the casserole. 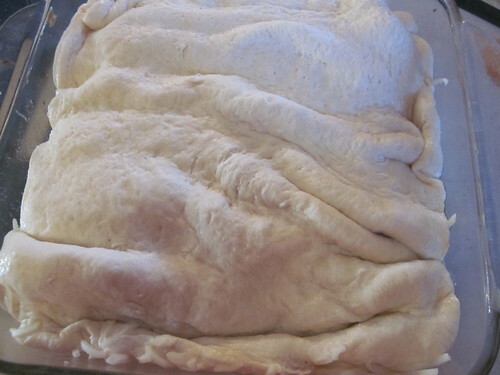 Cut a few slices in the dough so that the steam has a place to escape, then put it in the oven for 15 minutes. 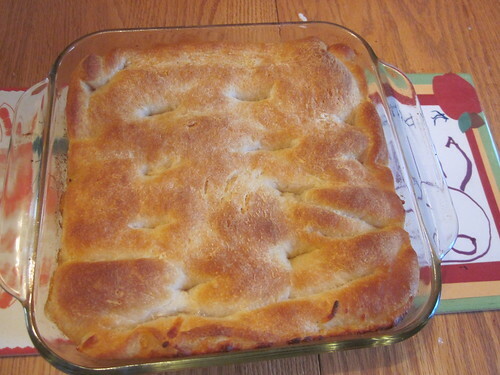 You end up with a beautiful and tasty casserole. 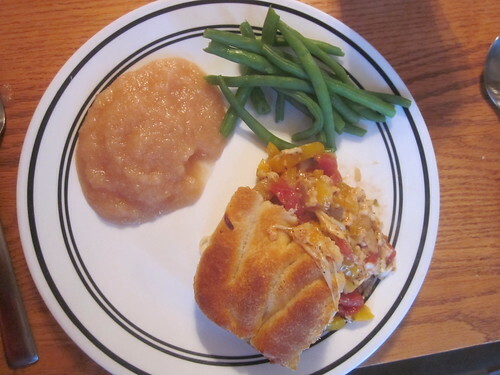 We served it with some fresh applesauce and a few remaining green beans from our garden. As I mentioned above, you can use pretty much any vegetable in this. Corn, spinach, potatoes, broccoli, cauliflower, Brussels sprouts – you name it and it’ll probably work in this. You can also vary the cheese, using other types in a mix with the mozzarella or on their own. No matter what you do, this pot pie will turn out well.